Life is a little more hectic at our house than usual. I have a new three month old baby, which has totally changed the dynamic of life with the almost three year old, and the ten month old that I am day nanny for. They are having a hard time with the sharing of attention with the new little one. She is a little blessing, and such a mellow, easy going baby, so that has helped me. Also, I am backlogged on my bookkeeping, and housekeeping after being punky before and after surgery in November. I am glad to report, I feel SO much better, and am getting stronger every day. It's been a long hard haul, though. We are just on the cusp of our lambing, so we've started checking ewes. That is logistically challenging, as they are in the sheep pasture five miles from our home. As things start to heat up in the lambing corrals, my life will be "foot feeder to the floor" so to speak. I have to plan a little to make it manageable. Turbo cooking can really save me at this time of the year. I am a huge fan of rotisserie chicken at the grocery store. I discovered at a local grocery store, that once the chickens are pulled from the heated case, they are drastically discounted, and in the cold case. For less than the price per pound for raw chicken, I can get tender and moist roasted chicken already cooled and ready for meal preparation. Now, I am not big on already prepared foods, but I love this one. So, on Thursday, my son Joel and I turbo cooked several meals from the two roast chickens we bought on our last shopping day. We produced food for three lunches and a dinner, and put away two more meals in the freezer. is freezer and refrigerator star. It can easily be made from the carcass left from harvesting the chicken meat. Bones that have been roasted with the meat on are the best for stock, so don't throw that chicken carcass away! I cover the carcasses with water an inch above them, and add a half an onion, some celery chopped, and a couple chunked up carrots. The only seasoning for me at this point is a hand full of peppercorns, three bay leaves, and a tsp of thyme or poultry seasoning. I cover the pot, and bring it to a boil. It then goes covered on the simmer burner on low for several hours, until the carcass falls apart and gives up the last of it's meaty bits. I then pour the contents into another large pot that has a colander in it. After it cools a bit, I sift through the contents of the colander, removing the last of the meat, and throw the rest away. The vegetables used to flavor the stock have given their all, and are too soft to use. I now have several quarts of stock to store in my fridge or put in the freezer. I am not a big fan of canned soup. I know most people use it for casseroles, but I don't like the flavor, the salt content, or the price of it. I can make a cream soup in about ten minutes on my stove, so I choose to do that instead. If you can make gravy, you can make cream soup. The only difference in the two is that you don't add as much liquid to gravy. 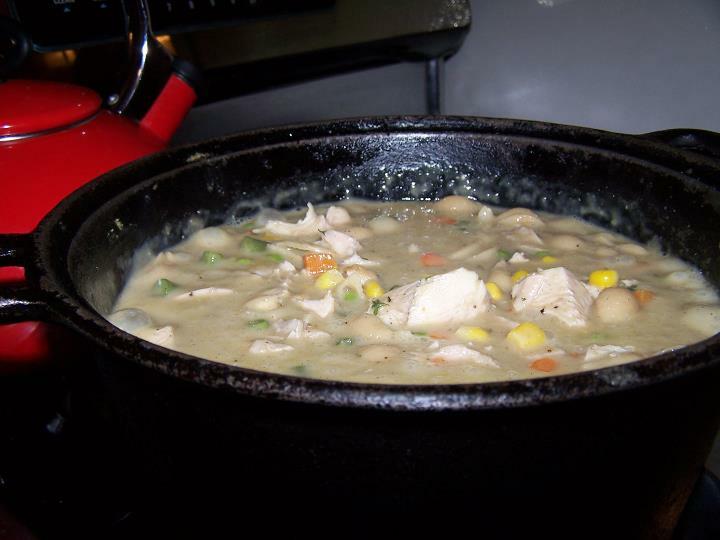 For instance, I made cream of chicken soup from chicken stock (see above) and milk- no cream for the chicken pot pie. It is silky and lovely, and if I wished could be lunch on it's own. I start with a half a stick of butter melted in my skillet cooked with a couple heaping tablespoons of flour, and cooked until it is foamy, turns golden brown and smells nutty. With a wire whisk, I start adding chicken stock, adding small additions, and smoothing out the gravy/soup before adding more. After a quart has been added, I'll add in 2 cups of milk, and stir on the heat until it bubbles. I will season to taste with salt and pepper and a sprinkle of poultry seasoning, and adjust the consistency at this point by adding more stock as necessary. For pot pie I stop at a medium bodied gravy. I have potatoes in this dish, and they will tighten up the liquid during cooking. If you wish to use canned soups for my recipes, just substitute one can of soup, and a half a can of water or milk. In a greased 9x13 pan, put all the ingredients above, and pour over the chicken soup. Cover with foil, and bake at 350 F for one hour. At this point, you can cool the pan, and freeze it for later use. On the day you use it, place it in the oven until it is hot and bubbly at 350 F, and then top with your favorite biscuits. Return to the oven and cook until biscuits are golden brown, about ten minutes. We ate ours the same day, so I just took off the foil and added buttermilk biscuits to the top after the one hour cooking time. This made awesome lunch for two more days, and was even better reheated. In a large pot, brown onions in oil. Add in remaining ingredients except noodles. Bring to a boil, cover and reduce to a simmer until vegetables are tender. Bring back to a boil, and add noodles. This made a great lunch, and also put two quarts of soup in the freezer. For meal number three, I made cream of mushroom soup. I browned two packages of sliced button mushrooms in 2 T butter. I removed them from the pan, started my rue of butter and flour, and then added mushroom stock. (This was made from soaking dried mushrooms in boiling water. I reserved the mushrooms for another meal, and carefully poured off the broth, leaving the gritty bits in the bowl.) I add two cups of milk, and adjust with more broth or water to get the desired medium bodied gravy thickness, and season with salt and pepper. You can certainly substitute with canned soup and a half a can of water for this recipe. Cook pasta and drain into a colander in which you have placed the frozen artichokes to defrost them quickly. Fill the same pot with water again, and bring to a boil. Salt water and blanch asparagus until it turns bright green. Drain into the colander with pasta and artichokes. In a greased roaster pan, add chicken, pasta and vegetables, and pour over mushroom gravy. At this point, I cooled it, and it went into the refrigerator for Sunday dinner. I could also freeze it. On the day I serve it, I'll top it with 1 C seasoned breadcrumbs mixed with 1/3 C Parmesan cheese and cook it uncovered in a 350F oven until it is bubbly, about twenty minutes. The vegetables are all cooked, so it is just a matter of heating it through and browning the top.